1. Solar system cabinet includes inverter, solar charge controller and battery which it is easy and convenient to connect and maintain. 2. 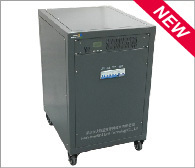 MPPT solar charge controller: the controller maximum efficiency has reached to 96.8% with the advanced MPPT technology. 3. Digital inverter: the inverter use high efficiency DSP control and standard rack-mounted structure to achieve small volume, light weight, stable performance and easy installation way. 4. Perfect protection function: the over-charge and over-discharge protection for battery to prolong battery life, also equip with over load protection, short circuit protection and over temperature protection function to ensure equipment safely. 5. LCD and LED display: solar charge controller display with LED light, yellow and green light show the different work condition; inverter has LCD displayer, and display input voltage and output voltage, frequency, battery voltage, load and temperature.